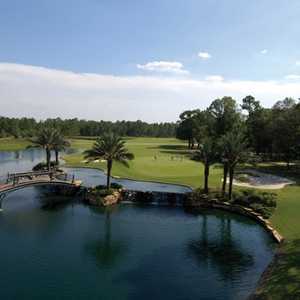 ORANGE PARK, Fla. -- The Eagle Landing golf course at Oakleaf Plantation, located outside Jacksonville in Orange Park, opened in 2006. 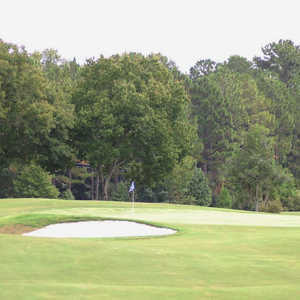 The long par-3 sixth hole at Eagle Landing golf course near Jacksonville. 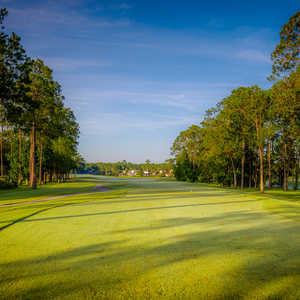 Eagle Landing Golf Club features an open, links-style layout that meanders through tall groves of Southern pine and palmetto. Situated in the center of the beautiful Oakleaf Plantation bordering the Johnson State Forest, the scenic landscape offers views of native wetlands and conservation areas. A Clyde Johnston design, the golf course builds at the beginning of each nine and gets harder, but it's never boring, never easy. Common features throughout are elevated greens and huge bunkers that take chunks out of fairways and greens. Other times, they just lay in wait under shaved slopes by the green. Don't be misled by the whimsical tufts of vegetation atop them. Those bunkers can be mean. Johnston also has a habit of placing hazards based on prevailing winds. The long par-3 sixth hole concentrates all of its misery on the right because the wind comes from the left. Your problems are water if you're short and caught in the wind. If you gauged the length correctly, you could still be sitting in sand if the wind gusts. Johnston also pairs backstop bunkers with opportunities to cut corners. If you go for it, you're going for distance. But if you sort of forget to aim at the corner, that bunker is going to catch you. The most memorable run of holes is from 15 to the clubhouse. The par-4 15th is besieged with bunkers on the left side, then both sides, then to the right -- and that's just along the fairway. There are huge bunkers on each side of the green, and it drops off in the back. There's a lot of sand, even for a long par 4 that exceeds 400 yards from the whites. Wind comes into play for the second half of the hole, too. Eagle Landing's 16th is a lengthy par 3 over a bunker field, and no. 17 is a par-5 dogleg right around church pew bunkers. Fortunately, the landing area is pretty generous. On the last hole, it's such a pretty approach around a small lake up to the clubhouse that it's kind of hard to concentrate. You had better, though. The offset green is heavily bunkered on both sides and the back. If you're really astray, there is water, too. In summary, the golf course relies on bunkers and mounds rather than trees, but that's okay. The sand is nice and fluffy and mounds never hurt anyone too badly. Trees, however, do come into play on a few holes. The trick to the course is more length than accuracy. It's a course for boomers, baby or not. Fortunately, there's plenty of room to roam. Try out Eagle Landing. You'll be warmly welcomed and treated well by staff no matter where you go, from the cart area to the pro shop, the large practice facility, the dining rooms or the bar and grill. There's also a magnificent veranda overlooking the ninth and 18th holes. Eagle Landing is a great place to roam around, either chasing a ball in a golf cart or seeking food on foot.